Nothing fishy about it - You're his prize catch and he's yours, too! Celebrate always with our teal pinstriped handmade paper frame adorned with hand wrapped and wired natural rock crystals, adorable blown glass fishes and beads, a goldplated clam, and rainbow fluorite. 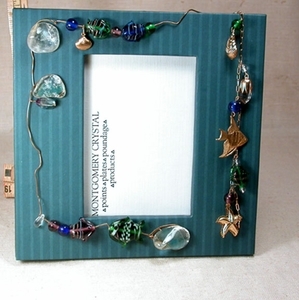 It's 6-7/8" square with room for your favorite fish, boat, beach or other shot of 3-1/2 x 5". 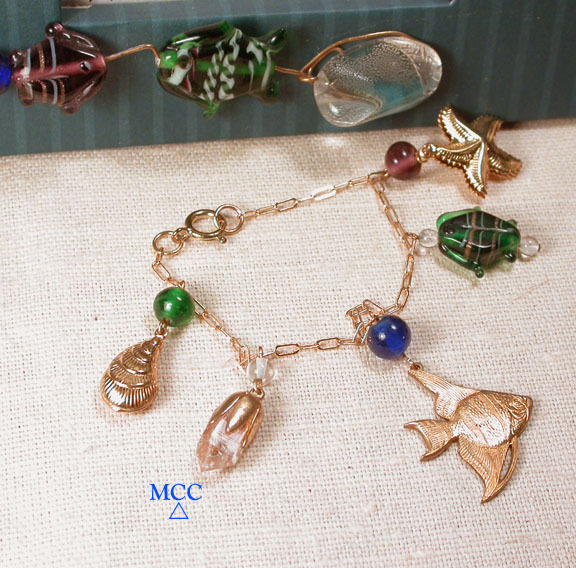 Unhook the goldfill 7-1/4" charm bracelet - it's yours to wear when it's not gracing the frame - with a capped Arkansas quartz crystal, rock crystal beads, goldplated shell, starfish, angel fish and more, you're the charm!